It’s true. Well, at least in these photos. In my life sometimes the struggle of cooking a decent meal because of laziness is a very real. Especially at night and Mondays. However there is a hope! I actually don’t have a choice to cook when it comes to my daughter, who I’m raising to be vegetarian /vegan. She absolutely has to have her protein, whole grains, and fresh/frozen organic fruit. 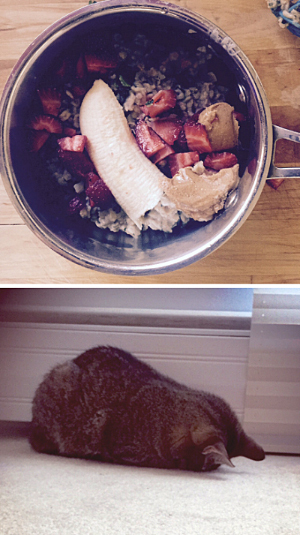 You’ll see in the photo a pot of oatmeal with a banana, spinach, peanut butter and some strawberries. It seems strange with the spinach but we succeed in getting her all the nutrients.But for us adults, we gotta do better lol. I love my cat – at times she is a reflection of how i feel – like today- Monday. But I’ve got a plan: buy healthy frozen foods. I love the organic frozen kale and quinoa meals at Costco.com and it works. But in order to see, my daughter’s future birthdays, graduations and more I gotta be wayyyy more healthier and ready!